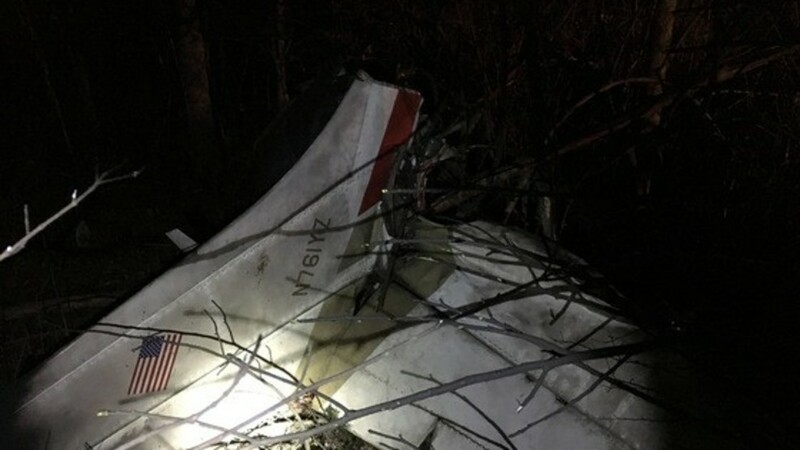 On December 16, 2017, about 2058 eastern standard time, a Cessna T210M airplane, N761YZ, impacted trees and terrain following a reported loss of engine power near Oldenburg, Indiana. A postimpact fire ensued and the airplane was destroyed. The pilot, pilot-rated passenger, and passenger were fatally injured. The airplane was registered to N761YZ LLC and operated by the pilot as a 14 Code of Federal Regulations Part 91 personal flight. Night visual meteorological conditions prevailed. The flight was operated on an instrument flight rules flight plan and originated from the Columbus Municipal Airport (BAK), Columbus, Indiana, about 2039. The intended destination was the Frederick Municipal Airport (FDK), Frederick, Maryland. The flight initially departed the Charles B Wheeler Downtown Airport (MKC), Kansas City, Missouri, about 1657, and landed at BAK about 1927. Airport records indicated that an individual associated with N761YZ purchased fuel from the self-service pump at 2032. Air traffic control (ATC) data indicated that the accident flight departed from runway 23 at BAK. After takeoff, the airplane turned left and proceeded on an easterly course. The controller instructed the pilot to climb and maintain 11,000 feet mean sea level (msl). At 2052:00, the airplane reached an altitude of approximately 7,450 feet msl before it began a gradual descent. At 2052:30, the pilot transmitted "mayday, mayday, mayday." He informed the controller that they were experiencing a "partial engine failure" and "needed to get down." The airplane was about 26 miles east of BAK and approximately 4 miles southwest of the Batesville Airport (HLB) at that time. The pilot inquired about diverting to HLB. The controller confirmed that HLB was the closest airport, but also informed the pilot that the airport was listed as closed. The pilot subsequently over flew HLB about 4,000 feet msl, proceeded about 2 miles north, and executed a right 270-degree turn to a west heading. The final radar data point was recorded at 2057:28 and located about 1.5 miles northeast of the HLB runway 18 approach threshold. The altitude associated with the final data point was 1,050 feet msl. The accident site was located in a wooded ravine about 0.65 mile northwest of the final radar data point, and about 1.44 miles north of the HLB runway 18 approach threshold, at an approximate elevation of 855 feet. The main wreckage came to rest about 202 feet northeast (316 degrees) from the initial tree strike. The main wreckage consisted of the fuselage, engine and right wing. The right-wing tip was separated and located in a tree about 35 feet above ground level near the initial tree strike. Fragments from the right aileron and right-wing flap were located on the ground near the initial tree strike. The left wing was separated and located about 60 feet from the main wreckage. The empennage and propeller were separated and located adjacent to each other, about 41 feet from the main wreckage. The fuselage and right wing were damaged by the postimpact fire. The left wing and empennage exhibited sooting due to the fire. The right-wing tip, right aileron, and right flap fragments did not exhibit any fire damage or sooting. All flight control surfaces were present at the accident site. No anomalies with respect to a preimpact malfunction of the flight control system were observed. The engine remained attached to the firewall and the aft portion of the engine sustained fire damage. The propeller had separated at the engine crankshaft flange. A teardown examination of the engine revealed damage to the No. 4 cylinder and piston. Those components have been sent to the NTSB materials laboratory for further examination. Federal Aviation Administration Notices to Airmen (NOTAM) data indicated that HLB was closed from December 6, 2017, until March 5, 2018. A representative of the airport reported that, because the airport was closed, no runway lighting was available. (Batesville, Ind.) – The identities of three victims of a small plane crash in Franklin County have been released. The Civil Air Patrol says the victims were Louis Cantilena and Paul Schuda, as well as Cantilena’s daughter Amy. Cantilena and Schuda were both majors with the Civil Air Patrol, an auxiliary to the U.S. Air Force. A dog aboard the single-engine Cessna died while a second dog was the sole survivor of the crash. Louis Cantilena was piloting the plane when it went down Saturday night near the Batesville Airport as the crew was making a day trip from Maryland to Kansas City and back. The two men had flown to Missouri to pick up Amy Cantilena from medical school. The group had just refueled and departed from the Columbus, Indiana airport bound for an airport in Frederick, Maryland only about 20 to 30 minutes before the plane went down in a wooded area near North Hamburg Road, only about a mile from the recently closed Batesville Airport. Two Civil Air Patrol members, one from the National Capital Wing and the other from the national Congressional Squadron, were killed late Saturday when their plane crashed after experiencing engine failure in southern Illinois. Majs. Louis R. Cantilena, who was flying the private plane, and Paul F. Schuda died after Cantilena’s Cessna crashed in woods about 9 p.m. near Oldenburg, Indiana, about 40 miles northwest of Cincinnati, according to an Associated Press report. Cantilena’s daughter was also killed, as was one of two dogs in the plane, Indiana State Police said. According to The Associated Press, State Police Sgt. Wheeles said the Cessna had taken off from an airport outside Columbus, Indiana, while en route from Kansas City, Missouri, to Frederick, Maryland. Schuda was the National Capital Wing’s standardization/evaluation officer and assistant director of operations. He also served as an instructor at CAP’s Col. Roland Butler Powered Flight Academy at Blackstone, Virginia. He previously served as the Congressional Squadron’s chief of staff from 2006-2012. He joined CAP in March 1998, transferring from the Congressional Squadron to the National Capital Wing in July 2012. Schuda was director of the National Transportation Safety Board Training Center at Ashburn, Virginia. He previously served as deputy director for the U.S. Environmental Protection Agency’s Policy and Special Projects staff and as a professor of chemistry at the University of Maryland, College Park. Cantilena joined CAP in February 1997. He was a professor of medicine in clinical pharmacology and director of clinical pharmacology and medical toxicology at Uniformed Services University of the Health Sciences in Bethesda, Maryland. He also directed a Phase One Clinical Research Unit funded by the National Institutes of Health and the U.S Army and served as a consultant to the National Institutes of Health and the federal Food and Drug Administration. 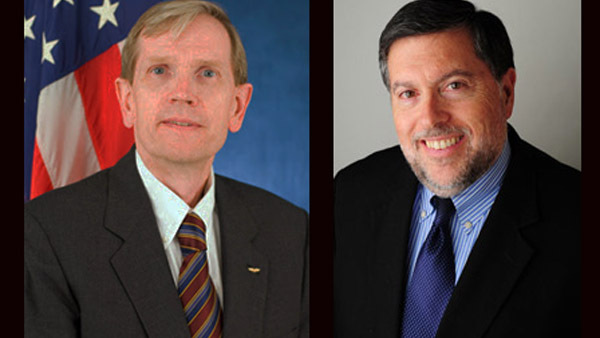 Dr. Louis Cantilena, 63, of Potomac, Maryland, the pilot; and Dr. Paul Schuda, 65, of Arlington, Virginia. COLUMBUS, Ind. — An airplane that crashed in Franklin County and killed three people stopped for fuel twice at Columbus Municipal Airport, officials said. A single-engine Cessna that left Kansas City, Missouri, was headed to an airport in Frederick, Maryland, when the crash occurred at 9:10 p.m. Saturday in a wooded area in Oldenburg in southeastern Indiana, said Sgt. Stephen Wheeles, Indiana State Police spokesman. Emergency responders were notified that an aircraft had crashed and that the plane possibly caught fire, he said. Air traffic control at Cincinnati/Northern Kentucky International Airport had reported that a plane had disappeared from radar in the area where the crash was reported, Wheeles said. Fire from the wreckage was discovered in a wooded area behind a residence, where three people and a dog were found dead, Wheeles said. A second dog survived, he said. The three who died in the crash were identified Tuesday afternoon as Dr. Louis Cantilena, 63, of Potomac, Maryland, the pilot; Dr. Paul Schuda, 65, of Arlington, Virginia; and Dr. Amy Cantilena, 31, also of Potomac, daughter of the pilot, Wheeles said. Columbus Municipal Airport director Brian Payne said the Cessna had stopped at the airport on Saturday to purchase fuel at 12:02 p.m. and again 8:32 p.m., about a half-hour before the crash was reported. OLDENBURG, Ind. 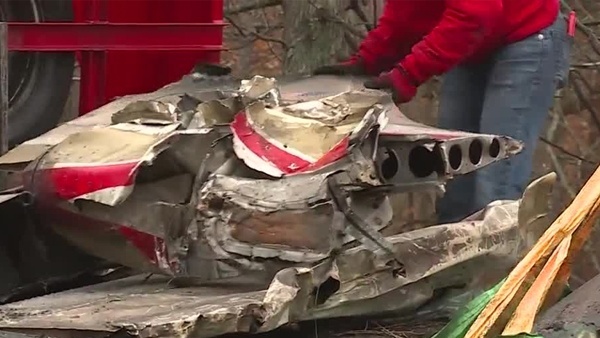 — Piece by piece, crews began to remove a plane that crashed Saturday in a wooded area near Oldenburg, Indiana, killing three people. “We begin by documenting the accident site, doing a detailed examination of the wreckage,” said Tim Sorensen, lead investigator at the scene for the National Transportation and Safety Board. Investigators recovered the engine and took it to a hangar near the crash site Monday. The tail section and parts of the wings were loaded onto a large flatbed truck to be taken for examination later. “The on-scene portion will run for a few days then we’ll gather information on the pilot; we’ll look at the weather,” Sorensen said. Investigators know the pilot was talking with air traffic controllers prior to the crash. Flight plans show the plane was making a one-day, round trip from Maryland to Kansas City, Missouri. The three occupants were on the return leg and had just stopped in Columbus, Indiana, about 40 miles away from the crash site. The victims killed have not yet been identified. Two dogs were also aboard the plane. One of them survived and was found injured and wandering nearby. The surviving dog is being treated by a local veterinarian and is expected to recover. (Batesville, Ind.) – A southeastern Indiana airport has announced that it is closing soon. Batesville Aviation Services owned by the Whittington family of Columbus, Indiana bought the former Hillenbrand Industries private airport in 2012. In 2016, they made the airport available for public use. On Friday, the company said it will close the airport on Enochsburg Road on December 1 due to a lack of support. 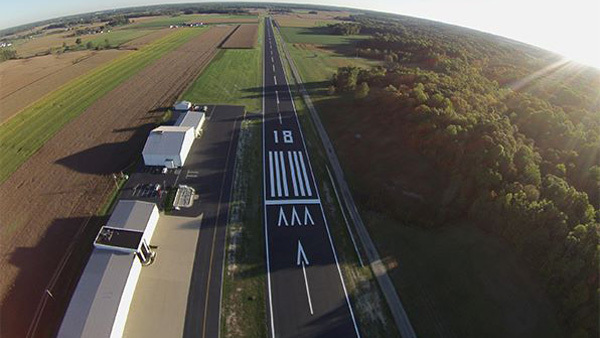 Batesville Aviation Services says it is open to the idea of working with Greensburg to have a combined regional airport. The airport was first opened in 1961 as a private landing strip for Hillenbrand Industries. (Batesville, Ind.) – Autopsies are scheduled Monday on the three victims of a Saturday night airplane crash near Batesville and Oldenburg. The Franklin County coroner says the bodies were recovered Saturday night after the single-engine aircraft went down in a wooded area off North Hamburg Road in Batesville. Three people and a dog died in the crash. A second dog was found injured and wandering near the wreckage. The single-engine Cessna was en route from Kansas City, Missouri to Frederick, Maryland. It had just made a stop and taken off from the Columbus, Indiana airport before the pilot appeared to steer toward the runway at the Batesville Airport, according to flight path data available on FlightAware.com. That airport closed on December 1. “Cincinnati Air Traffic Control reported that a plane that was being tracked disappeared from RADAR in the area where the crash was reported. Officers arrived on scene and located the fire from the wreckage in a heavily wooded area behind a residence. Fire personnel were able to make it to the crash scene and extinguish the flames,”said Indiana State Police Sgt. Stephen Wheeles. A cause of the crash has not been speculated by investigators at this point. Indiana State Police, the Federal Aviation Administration, National Transportation Safety Board, and the county coroner are investigating the crash. Wheeles said the investigation may take weeks to complete. “The victims’ identities will not be released until the Franklin County Coroner’s Office can confirm their identities and speak with the next of kin,” said Wheeles. 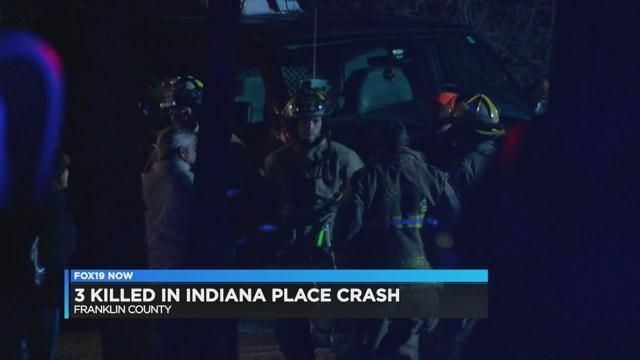 Oldenburg- Yesterday, December 16th, at approximately 9:10 pm, the Indiana State Police responded to reports of a plane crash in a wooded area in the 5000 Block of North Hamburg Road that claimed the lives of all three people on board. (Oldenburg, Ind.) – Three people were killed in a single-engine airplane crash in Franklin County Saturday night. It was around 9:00 p.m. when the crash was reported on Hamburg Road about a mile from the runway at Batesville Airport. Indiana State Police Sgt. Stephen Wheeles says three people and one dog were killed in the plane crash. No names have been released. A second dog, believed to have survived the crash, was found wandering near the scene. The Cessna T210 Turbo Centurion was flying from Kansas City, Missouri to Frederick, Maryland. According to information on FlightAware.com, the plane had made a stop at the Columbus, Indiana airport and taken off from there at about 8:39 p.m.
A reason for the fatal crash has not been released. State police are investigating along with the Federal Aviation Administration and the National Transportation Safety Board. Wheeles said more information may be released Sunday. FRANKLIN COUNTY, Ind. 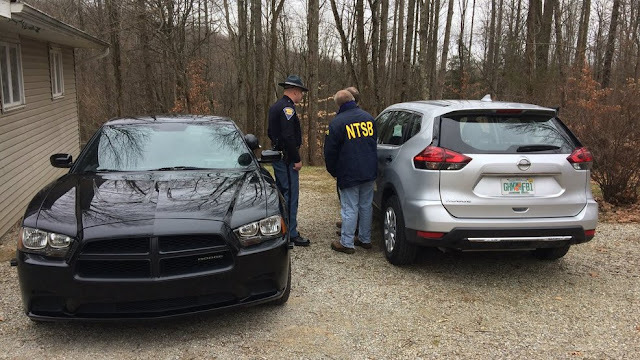 –Indiana State Police Troopers from the Versailles District are investigating a deadly small plane crash in rural Franklin County, near Oldenburg. Troopers are on the scene located north of Batesville. Authorities confirm that three people and one dog were killed in the crash. One dog did survive. The plane was a single-engine Cessna, going from Missouri to Maryland. Indiana — A small airplane crashed Saturday near Hamburg Road in Franklin County, Indiana, resulting in three deaths according to Indiana State Highway Patrol and our partners at WCPO. Indiana State Highway Patrol reports the plane originated in Kansas City, Missouri and stopped in Columbus, Indiana to refuel, before taking off for its final destination of Maryland. The plane was privately owned and ISP reports that three people were inside the plane at the time of the crash. Police are still working to identify the victims and the investigation is being handed over to the FAA. Police say the initial cause of the crash has been attributed to engine failure. FRANKLIN COUNTY, Ind. (WKRC) - Three people and a dog are dead after a small plane crashed Saturday night near Oldenburg, Indiana. Indiana State Police confirmed the crash happened around 9 p.m. in a wooded area behind a residence along Hamburg Road near Senft Road. The plane was on fire at the time police arrived. Firefighters were able to put those flames out. The plane, a single-engine Cessna, was in route from Kansas City, Missouri to Frederick, Maryland, according to information obtained by the ISP from the Federal Aviation Administration. It is unclear at this time what caused the plane to crash. Police said three people were on board and all three were found dead at the scene. Police also found a dead dog. Another dog survived the crash and was taken to see a vet. ISP said autopsies will be done on the three victims. Their names will not be released until the Franklin County Coroner's Office can confirm their identities and speak with their next of kin. ISP is conducting a joint investigation with the FAA and the NTSB. The investigation is ongoing and may last several weeks. OLDENBURG, Ind. — The initial investigation into a small plane crash in Indiana has determined that the single engine Cessna (Tail Number N761YZ) originated from Kansas City and was heading to an airport in Frederick, Maryland when the crash occurred.